This article is about the place. For the quest, see Bleak Falls Barrow (quest). Bleak Falls Barrow is a barrow located west of Riverwood. It contains two zones: Bleak Falls Temple and Bleak Falls Sanctum. The exterior of the barrow is guarded by three bandits with standard equipment. You may first hear of the barrow from Ralof or Hadvar, if you choose to accompany him to Riverwood after escaping from Helgen. Arvel the Swift goes into hiding here after stealing the golden claw from the Riverwood Trader. When you first enter the dungeon, you will find several dead skeevers, two dead bandits, and two more bandits idling by a campfire at the far end of the hall. After dispatching them and continuing on your way, you will see another bandit ahead of you going further into the temple... shortly after which you will hear his dying scream. His body will be in the next room, which has three pillars on the left and a locked gate in front of you. A lever in the middle of the room opens the gate, but only if the pillars on the left are set in the proper sequence. If they are not, the gate remains closed and a series of arrows will shoot in the direction of the lever. The correct sequence can be inferred by looking at the three statues in the room, two of which are found above the gate, and the third (the middle one, actually), fallen on the floor next to the lever. The pillars should be set to display the same symbols as the 3 statues: starting with the pillar farthest from the gate, this would be Snake—Snake—Whale. On the table in front of you as you enter the next room is a copy of the Pickpocket skill book Thief. Taking the stairs down will lead you to another lit room where three skeevers will come out and attack you. You should have no trouble with them even at very low levels, but you may contract Ataxia if you are unlucky. A scroll of fireball and a paralysis potion are on the table here. Press on, and you will soon hear Arvel calling out to you for help, assuming you are one of his bandit partners (Harknir, Bjorn and Soling). Before rushing to help him, note the thick webs near a skeleton at the end of the hallway, which conceal a chest. More webs block your path to Arvel: cut your way through them and enter the chamber, and a giant frostbite spider will drop down and engage you in combat. If you have problems beating it, you can retreat back through the archway to recover, since the spider is too large to leave the room. Once you kill it, loot it for its venom and proceed to cut down Arvel, who will ungratefully rush off further into the dungeon. You can kill Arvel before he escapes, if you are quick enough. Chasing after him, you will pass through an embalming room with some minor loot, into a burial chamber with corpses lining the walls. You can loot any that aren't skeletal. As you reach the bottom of the ramp though, you'll see one of the corpses (known as draugr) rise from the dead and prepare to attack you, and may see or hear others doing the same. Only draugr in armor (male) or tattered clothes (female) will reanimate: the ones still in wraps or naked are "permanently dead". If you're careful and observant, you'll be able to tell if a draugr is going to attack you or not before they wake up. After the battle, you will find Arvel's corpse on the ground. If he avoided being killed by a draugr, then he will die after activating a pressure plate, triggering the spike wall on your right. Recover the Golden Claw and read his journal, which will provide a crucial clue for an obstacle you will encounter later on. Step around the plate or behind the gate and continue into the hallway. Your quest journal now tells you to find the secret of Bleak Falls Barrow. Straight ahead is another sleeping draugr, and after him a room where three more will reanimate and come for you. Although they're fairly weak, they can be dangerous if you're lightly armored and get surrounded. If you're careful, you can wake them one at a time and deal with them individually. A short collapsed staircase on the right leads to a locked treasure chest. On the left is a swinging blade trap, which you can't do anything about from this side. Timing a sprint through it will leave you unscathed. You can then pull the chain on your left to deactivate the trap, allowing you to hear better and escape into the previous areas if needed. Proceed through the winding passages, dealing with the "resting" draugr as you go. At one point, you may notice a prismatic sheen on the floor: this is an oil slick trap. The tunnel will open out into a large, well-lit cavern with a waterfall. 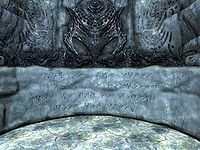 As you enter, a draugr will burst out of a sarcophagus in the opposite corner, but you can easily take it out with ranged attacks before it reaches you. The way ahead is blocked, so after looting the chest head to the gate the stream drains through and pull the chain beside it to raise the gate and continue downstream, stopping where the stream drops off into a large cavern open to the sky. If you stand at the edge of the waterfall and look down, you will see either a leveled draugr or, at level 18 or higher, a frost troll and above you and to your right a rope hanging from a log that spans the open top of the cavern. A ledge below the end of the rope holds the body of Thomas, a Breton that evidently died trying to climb down the rope into the cavern. From here, you can either shoot the enemy below, or turn right and take the passageway down to meet it head on. A quick detour to the bottom of the waterfall will net you some more loot, then it's time to head north and follow the path to the end of this zone. Only one more draugr stands between you and the exit: he's a little stronger than most of the others so far, but shouldn't pose any serious problems. Loot the chest when you're done, and head into the next zone. Inside the sanctum, you will encounter another blade trap. You'll arrive in a chamber with three draugr: one will climb out of a coffin close to the entrance, while the other two are on the upper level and much further in. Located between you and the draugr is an oil trap. Go up the stairs and around the chamber to cross a bridge leading to a large iron door. It opens to a long passageway blocked by a puzzle door. 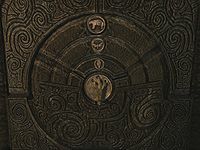 The locking mechanism is controlled by three concentric circles: each is marked with animal symbols and can be rotated. As hinted at in Arvel's journal, the correct combination is marked on the palm of the Golden Claw. From the outer to the inner circles, it is Bear—Moth—Owl. The default angle of the claw, when examined in your inventory, makes the symbols almost impossible to read. Putting the cursor over it and pressing your "Auto Move" button zooms in and allows you to rotate it easily so you can see them clearly. At the top of the stairs is a large, well-lit cavern. Proceed through it and across the bridge. Before walking across the dais, head behind the runed wall on the right-hand side to find a treasure chest behind the waterfall. There's another chest hidden behind the waterfall on the other side of the cavern as well. Return to the dais and loot the chest there, then walk into the arc of the wall. As you approach, you will hear chanting, the screen will rapidly darken, and part of the wall will start to glow, with threads of energy rushing from it to you—don't worry, they're harmless. Once you are close enough, you will "read" the glowing rune: the first word of the "Unrelenting Force" dragon shout. You won't be able to do anything with it yet. The surge of magic will cause a draugr "boss" to burst from his coffin and attack. This enemy is much stronger than the draugr you faced previously. Your best option is to pour out as much damage as you can as quickly as you can (use Fire spells if you're a mage), drink healing potions sooner rather than later, and if things get desperate (or you prefer to use ranged attacks) sprint past him to buy some breathing room. There are a few locations in the cavern where you can maneuver yourself into a safe place to snipe at him from if need be: across the river in the southern corner works well. Once he's dead, loot his corpse for the Dragonstone. Following the passage at the top of the stairs, you will come to what appears to be a dead end. There is a pedestal nearby with a handle on it: activate it to lower the rock wall in front of you, opening a passage to yet another chest and an exit out to the opposite side of the mountain from where you entered the barrow. To the left of the exit, on the ground, is a potion. The word you have just learned is "FUS". 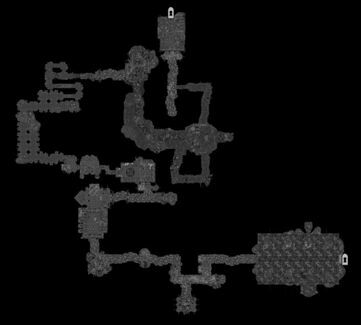 There are two iron ore veins: one in the Temple half way through the hall with the Draugr respectively the Troll, to the right hand, where a skeleton and two pickaxes can be found; the second is in the Sanctum, to the left at the wall right before the hall opens to the area with the Word Wall. The rope and the body of Thomas will not be present in Bleak Falls Temple if you are level 17 or below, as his presence is related to the frost troll in that cavern. A Strongbox with an Adept lock and an Apothecary's Satchel can be found in a corner outside the Temple. Facing the entrance, turn left and go along the wall. An unmarked location called Bleak Falls Tower can be found on the other side of the mountain to the east, along the path to Riverwood. It is home to three leveled bandits that will attack you if you approach too closely. On certain saves the three pillars that need to be turned to display the right sequence sometimes do not turn, therefore stopping you proceeding on through the Barrow and halting progress on the Main Quest-line, Bleak Falls Barrow quest and The Golden Claw quest. If you cast a Fury spell on the Wounded Frostbite Spider, she may attack Arvel, releasing him from the web. He will join you in fighting her, then stand there begging you to cut him down. Spells and weapons will pass through him. Destroying the spider webs will continue the dungeon as normal. If the dragon claw door does not work, check here for possible fixes. You may be unable to loot the Guardian of the Dragonstone once defeated, thus making it impossible to complete the Dragonstone quest. If this happens, first try leaving the area and re-entering. If that doesn't work, deliver the Golden Claw to Lucan Valerius in Riverwood, then return to Bleak Falls Barrow and the Guardian should be searchable. If you return to the barrow later on and approach the word wall, you may hear the chanting sound even though you've already learned the word here. This page was last modified on 21 April 2018, at 06:20.